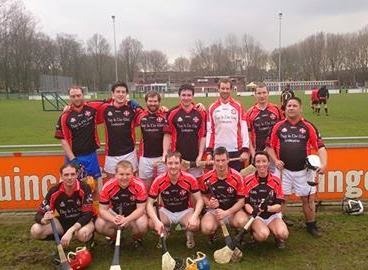 Amsterdam Gaelic Athletic Club: The wait is over…hurling has arrived in the ‘Dam! The wait is over…hurling has arrived in the ‘Dam! This weekend will be a historic, and hopefully successful, one for Amsterdam Gaelic Athletic Club. An eleven year wait ends as the club enters their first ever men’s hurling team into a European GAA tournament! It has been a long time coming, but thanks to the work of captain Jack O’Gorman, and selectors Aonghus O’Driscoll & Colm Ryan, a 14 man squad will travel to Luxembourg to take part in the European Hurling Championship. While gaelic football took off immediately in Amsterdam when the club was set up in 2003, hurling was a bit slower to get off the ground. However the number of club members wanting to play the fastest game on earth has steadily been growing over the past 4 years. Due to the hard work and commitment of Jack, and his predecessor Brian Murphy, nowadays you’re more likely to see a hurley & sliotar at an Amsterdam training session, then a football. The team is a mix of long-term hurling pro’s and recent converts from football to the small ball game. A friendly match took place in March against neighbours Den Haag, and this weekend, Amsterdam will pit their skills against Belgium, Luxembourg and Zurich, amongst others. It’s sure to be a great weekend for the team and the club itself. Here’s to the first of many hurling tournaments for Amsterdam GAC.